I'm sitting in the Lake Hoare hut in the heart of Taylor Valley, waiting for a helicopter that will take me, Thomas Nylen (whose photos are in this post), and Jim O'Connor (a colleague from the US Geological Survey) down to the end of the valley for one last day of fieldwork. It definitely makes me sad to be leaving the field (and sadder to know that I have a solid week of labwork ahead of me--the same kinds of things I did earlier this season). But we couldn't ask for better weather, or a better last project. We'll launch from Lake Hoare aboard an A-Star helicopter. 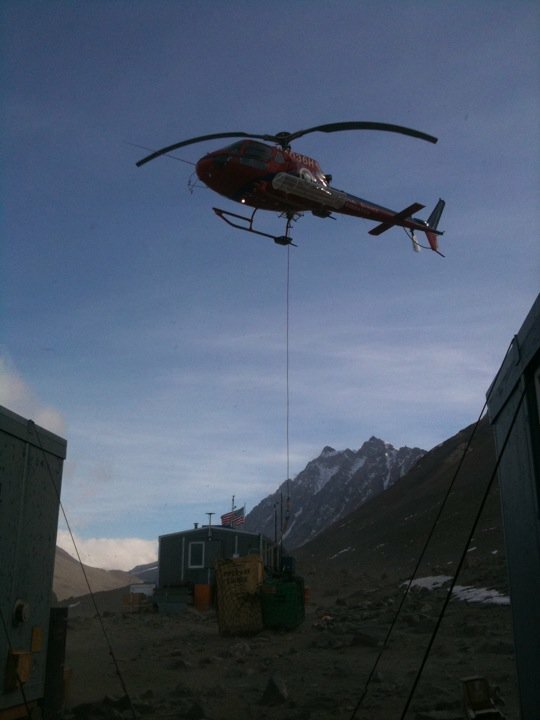 An A-Star helicopter dropping off a "sling load" (cargo attached to the helicopter by a cable). A short flight down the valley, and we'll arrive at the New Harbor camp--a small hut and lab on the shore of the Ross Sea. I'm going to meet Ron Sletten, another permafrost geologist, to talk about a research borehole he's drilled into the soil here. Jim is going to look at more paleo-deltas from when the lakes of Taylor Valley were linked and flowed into the Ross Sea. Then we'll walk inland to a spot called "Explorer's Cove." The LTER maintains a weather station there, where Thomas needs to do some maintenance work, and I need to collect one last soil sample. Then we'll continue our hike inland, past the Lake Fryxell camp, and then up and over the Canada glacier back to Lake Hoare. It should be a pretty excellent walk. Not a bad way to wrap up an Antarctic field season. hi , im mackenzie from mr.magees class at christa mcAuliffe , and i was just wondering whats it like to live in such cold weather? , how is the food and does it ever go bad ? , and your sleeping skills how do you stay warm at night ? Living in the cold is not so bad. Here in the southern hemisphere, it's summer, so the sun feels warm even if the air is pretty cold. The real trick to staying warm it to dress in layers and to be active. Just hiking around to sample different soils, or carrying experimental equipment around is enough to keep us very warm because of all the exercise. Food is actually the other half of keeping warm. People's bodies need fuel to burn to do work (by metabolizing the food, you warm up). So any time I'm cold, I eat a chocolate bar and move around to get work done (we eat a lot of chocolate down here). Camp food can be good or bad, depending on who is cooking. Mostly, we eat frozen vegetables and frozen meat, and dried pasta and rice. What I really miss is fresh fruit, though. It's a good thing I've just got two more weeks here! At night, since you have to stop moving a sleep at some point, the key is to insulate yourself to hold heat in. We have big down-feather filled sleeping bags that are cozy on even the coldest night. Inside a tent and out of the wind, it's a pretty good night's rest. Thanks for the questions, Mackenzie! Hello, my name is Cassidy Anderson and I am in one of Mr.Magee's classes at christa mcauliffe middle school. I have a few questions to ask. Why do you think Antarctica looks like Mars and what does it have in common? What made you want to do what you are doing today? How many pieces of clothing does it take to stay warm? Thank you and have a nice day. Sorry for the delay in getting back to you! It's been a whirlwind end to the season. I've been busy packing up soil and water samples to ship home, cleaning field gear, and even taking a few last-minute trips by helicopter to pick up rocks from areas around McMurdo Station that I didn't have time to visit during the season. Antarctica and Mars are similar in terms of their climate: both are very cold and very dry (but Mars is much colder and much drier even than Antarctica--a cold winter's day in Antarctica is about as cold as a normal summer day near the martian poles). Because both places are cold and dry, they have been shaped similarly by ice moving over the landscape. In contrast, warm and humid places, like Florida, or even most of the USA, have their geology mostly shaped by water (flowing as rivers, falling as rain, etc.). If we want to study geology under super-cold, super-dry conditions, we can hop a flight down to Antarctica. It's much closer and much easier to get to than Mars! Our "uniform" down here is pretty standard. We wear a thick parka filled with goose down, a fleece shirt of some kind, long underwear, windproof overalls, and giant rubber boots (called "bunny boots" because they're bright white and kind of lumpy). It's a hard place to be cold! What inspired me to do what I'm doing today is a great question. I've always liked being outside, whether hiking around in Maryland, where I grew up, or biking in my neighborhood, or traveling around the country with my family. Geology (and really all of the Earth sciences) is great, I think, because it gives people who like exploring the Earth ways to really understand how our planet works. In my field, I get to be outside doing fieldwork several months out of the year, and then, when I'm back at my university, I get to analyze everything that I've seen, and share what I've learned with students and other scientists. It's a pretty great job, I think. Thanks for your questions, Cassidy!